Peter Hickman leads his Aspire-Ho by Bathams Racing team-mate Michael Rutter in the Macau Grand Prix. Triple Macau Grand Prix winner Peter Hickman says his victory in Saturday’s red-flagged race capped a memorable year. 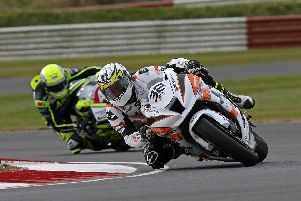 Hickman has been in red-hot form this season, winning the opening Superstock race at the North West 200 and sealing a Superstock and Senior double at the TT, where he set a new world road racing lap record at over 135mph. Peter Hickman celebrates his victory in the Macau Grand Prix on Saturday. Riding the Smiths BMW in the Aspire-Ho by Bathams Racing livery, he clinched his third win around the Guia street circuit in Macau by 0.7 seconds from team-mate Michael Rutter. A jubilant Hickman said: “As soon as we completed first practice, I was looking forward to the racing as the BMW was working well right from the off with my Smiths Racing crew working hard as always. We quickly found a great set-up and the track was in really good condition - probably the best I’ve seen it since 2015 - so I was able to take pole position, which was terrific as I’m not a qualifying rider really, more of a race day man. “Michael got a great start in the race but I was happy to sit behind him and follow him for a few laps before making my move. “I tried to break him and open a gap but after half distance he started to reel me in so I got my head down again to pull away once more before the red flags came out," added Hickman, who also won the weather-hit Superbike race at the Ulster Grand Prix. The race was halted with three laps to go when Ben Wylie and Phil Crowe crashed at Fisherman’s Bend. Crowe was not injured, although Wylie was taken to hospital. However, he was not reported to have sustained serious injuries. Smiths Racing team manager, Rebecca Smith, added: “We’re over the moon to have won the Macau Grand Prix with both Peter and Aspire-Ho by Bathams Racing and everyone has worked so hard to make it all possible.